0.1 Why Choose Takagi Tankless Water Heater? Takagi Industrial Company is a reputable Japanese manufacturer that has been manufacturing and designing tankless water heaters since 1952. Since then Takagi Company has constantly introduced amazing models and features; including the automated gas control valve systems, direct vent convertible water heater, computer modulating safety system and gas valve. Unique safety devices that use air-fuel ratio rod, greater 95 percent thermal efficiency ratings (T-H1 model). Here especially notable that the T-M1 model is the very first multi-gas water heating system for industrial applications. So if you are an industry owner, then probably Takagi Tankless Water Heater is the best solution you desire. Today, Takagi tankless water heaters manufacturer has several offices in the US, Canada, and Japan. Furthermore, to purchase one of their models you will have to contact their exclusive dealers or choose to buy them online. But I would suggest that you should buy from online as its the quickest way to purchase any product. 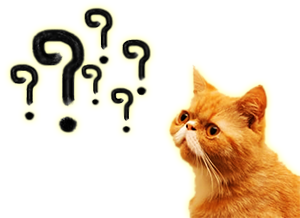 Why Choose Takagi Tankless Water Heater? Takagi water heaters would be an ideal solution for both small homeowners to large commercial areas, who are looking for greater versatility from the heating potable water heater to the application in the recirculation systems. From their smallest model T-KJr heaters to the largest model T-M50 you’ll find Takagi models that have greater energy efficiency. These use less energy, are environment-friendly. These meet or even exceed Low NOx standards as well as those that preserve natural resources by the use of 95 percent recyclable materials. Just like other well-known tankless heaters, Takagi water heaters provide an endless and on-demand supply of the hot water. These water heaters usually supply water with their sophisticated features that allow for a steady flow of the hot water with little fluctuation. All Takagi units use a wide range of features to protect the water heating system like overheat sensor, flame sensor, hi-limit switch, air control, thermistors, and various ceramic heaters in order to prevent the appliance from freezing when surrounding temperatures drop too low. Takagi uses small computers for the proper operation of the unit. The computer maximizes efficiency and also reduces the emission of the carbon monoxide gas. Additionally, the computer adjusts and monitors the fuel/air ratio and thus the quality of gas combustion. Takagi company is one of the manufacturers of tankless water heaters that offer the Direct Vent Convertible heaters. Furthermore, Takagi water heaters that are used in the residential applications have a warranty of 15 years on the heat exchanger and 5 years on the other parts. The warranty on commercial usage is 10 years. To top it off, Takagi tankless heaters are remarkably compact. As such, you can easily install the unit in spaces where a traditional tank-type heater wouldn’t be able to fit. 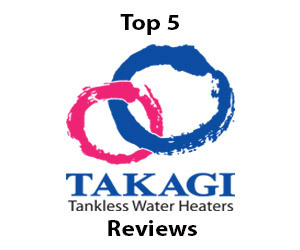 In this Takagi tankless water heater review, we shall look at the features and specifications of their top 5 models. 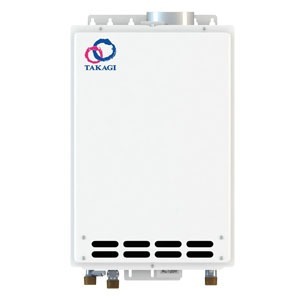 Takagi tankless water heater Company usually offers a very decent selection of the gas-fired tankless heaters for commercial and residential applications; from the low demand applications such as condos or small offices to the larger homes having multiple baths and also for use in industries. Released in 2010, the Takagi T-KJr2-IN-NG water heaters are the smallest units in the Takagi line of tankless water heaters. This small yet powerful unit is able to meet all hot-water needs of a small apartment or home with 1 or 2 bathrooms. The Takagi T-KJr2-IN-NG is environmentally friendly and cost-efficient. It can also be converted into the direct-vent unit just by making use of the optional TV10 conversion kit for installation in a utility closet, garage or any other confined space where makeup air might be limited. Inlet, outlet thermistors: This model comes with Inlet, outlet thermistors. These thermistors help the water heater maintain a constant desired temperature. Therefore, you will not face the cold water sandwich problem. 6.6 GPM: This amazing water heater can provide up to 6.6 gallons of hot water per minute. And it can do it at 35 degrees F rise. Energy factor of 0.81-0.83: Takagi T-KJr2-IN-NG needs an input of only 140,000 BTU. For this reason, this water heater is more than 83% efficient. Longer warranty: Takagi gives the best warranty offer on the market. It gives a 15-year warranty on the heat exchangers and 5-year warranty on parts. Cons: their warranty is only applicable if the heater is installed by a licensed technician. This is not so much of a problem since it is always better to install heaters by a technician. The model has been designed to do nearly anything that 40-gallon tank water heaters do. The compact and wall mounted Takagi T-KJr2-IN-NG can support the radiant floor or hydronic baseboard heating applications. It also provides domestic hot water supply to plumbing appliances and fixtures. The Takagi T-KJR2-IN-LP tankless water heater is the most compact heater in the Takagi tankless water heater line. It is designed to offer an endless supply of hot water alongside radiant heating for the smaller homes. The T-KJR2-IN-LP uses similar innovative technologies as the original Takagi heater – only on a smaller scale. Direct vent: The venting type of water heater is a direct vent. You will need 4-Inch category III stainless steel for venting. Therefore, you will not have to worry about the combustion gas ruining your household. Energy efficiency: Takagi T-KJR2-IN-LP is very efficient in terms of energy. It requires minimum 19,500 BTU per hour and maximum 140,000 BTU per hour input. Therefore, the energy factor of this heater ranges from 0.81 to 0.83. 6.6 GPM: This amazing water heater can provide up to 6.6 gallons of hot water per minute. This flow rate is a lot considering the fact that the heater runs on liquid propane. Compact design: This is a small yet very efficient unit, weighing only 37.8 pounds. 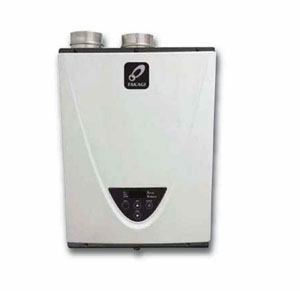 This small gas water heater is perfect for cottages, camps as well as for other specific applications where smaller volumes of hot water are desired. The compact size also means that you’ll save valuable floor space. Cons: like Takagi T-KJr2-IN-NG, this water heater also gives warranty provided that you install the heater by a licensed technician. This is an amazing water heater. You will not have to worry about the wastage of space while installing this great water heater. The Takagi T-H3-DV-N is a 59 pound highly efficient Natural Gas heater with the ability to produce 10 gallons/minute. The Takagi T-H3 has a dimension of 11.2 by 17.8 by 24.9 inches. This unit also occupies little space in homes. It has been designed for the indoor installation and has a higher energy star rating. 10 GPM: One of the amazing features of this product is that it has the capability of delivering 10 gallons of hot water per minute. And this water heater can do this at 100-185 degrees Fahrenheit rise. Energy efficiency: This unit has a very high energy star rating. It needs gas input of only 199,000 BTU per hour. This makes the heater highly efficient in the continuous supply of the hot water to up to 4 bathrooms in the warmer climates or 3 in the colder climates. Ultra-Low NOx Emissions: This amazing water heater meets the South Coast Air Quality Management District rule and emits a very low amount of NOx gas. Therefore, Takagi T-H3-DV-N is one of the most environment-friendly water heaters you will ever come across. Cons: this water heater is suitable only for indoor use. Other than that, it is an amazing heater. This is one of the most economical and environment-friendly water heaters in the market. You will not have to worry about the durability of it one you install the heater. 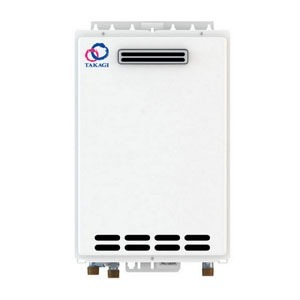 The Takagi tankless T-K4 is a compact and wall-mounted whole-house heater that is designed to provide an endless and on-demand supply of the hot water in large amounts. The T-K4/U water heaters are used for space heating in commercial and residential applications. No venting required: This amazing water heater comes with a built-in power venting system. Therefore, it does not need any additional venting. It makes the installation of the heater easier. 8 GPM: This heater has one of the most amazing flow rates in the market. This spectacular heater can provide you with 8 gallons of hot water at its maximum efficiency. Built-in freeze protection: This unique feature prevents the water from getting freeze. Therefore, you will never have to worry about getting cold water even for a second. Constant temperature monitoring: This tankless water heater uses both inlet and outlet thermistors. These thermistors allow the heater to monitor the temperature on a regular basis. Cons: The warranty that comes with this heater is relatively lower than the other water heaters. But you do not have to worry about it, because this water heater will serve you for a lifetime. It is very reliable and efficient. The Takagi Tankless T-K4 is the perfect tankless heater for smaller households and families that only use less than two hot water appliances at a time. The Takagi T-KJr2-OS-NG Outdoor Water Heater is one of the smallest Takagi units. The T-KJr2 is ideal for light residential (small apartment units) and the radiant heating applications. The Takagi T-KJr2-OS-NG can also be converted to direct-vent units using the optional TV10 conversions kit for installation in the garages and other confined spaces. 0.82 energy factor: It means that the heater is highly efficient in terms of producing heat. Therefore, The Takagi T-KJr2-OS-NG Outdoor Tankless Water Heater can practically do anything that a 40-gallon tank-type heater can do. This heater only needs gas input of 19,500 – 140,000 BTU per hour to operate. Direct-vent heater: It can also be converted into a direct-vent heater by using the optional TV10 conversions kit for installation in the garage. Compact design: This heater is small yet very powerful, weighing only 38 pounds. 6.6 GPM: It can provide a maximum of 6.6 gallons of hot water per minute. If you think about it, that is a lot. Cons: This heater can only be installed outside the house. But that should not be a problem since it is very energy efficient. This is an environmentally friendly and cost-efficient water heater. This heater will also meet all your hot water needs. A hot shower is a luxury of modern life that should not be taken for granted. 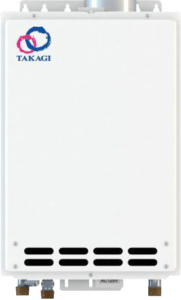 For close to a century, Takagi has enjoyed a good reputation as a world-class innovator as well as supplier in the tankless water heater’s industry. To sum it up, Takagi offers a wide array of water heaters – they come in different shapes and sizes, they are easy to handle and install and they are designed to protect the surrounding environment by lowering the energy and water consumption. These heaters are cost-effective solutions for improving the comfort of your home. Please contact us if you got any queries or any confusions about any kind of heaters for your home.